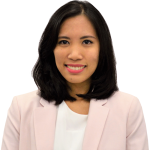 Chayamon (Amm) Sinhaseni is a director in BGA’s office in Washington, D.C. Chayamon first joined BGA as an analyst in BGA’s Thailand office where she provided policy support and helped clients foster engagement with the Thai government and local stakeholders. Chayamon is client service-driven and brings with her many years of consultancy experience across multiple sectors, including in fast-moving consumer goods, banking, government relations and sustainable development. Prior to joining BGA, Chayamon was an account manager at Kantar, a consumer research and consultancy company, where she advised clients on Thai consumer behavior and economic development to help grow and sustain their businesses. Earlier, Chayamon worked as a corporate social responsibility consultant at Kenan Institute Asia, a non-government organization operating in the Greater Mekong sub-region to foster sustainable development. She managed projects that brought together public, private, international and local stakeholders. Originally from Bangkok, Chayamon spent her childhood years the United States and New Zealand. She holds a master’s degree in political science from Columbia University in New York, concentrating in international relations and political economy, after which she spent six months as an intern at the Permanent Mission of Thailand to the United Nations. She received her bachelor’s degree in economics from Chulalongkorn University in Bangkok.